If you are familiar with the CK-12 Foundation, then you are probably familiar with the free resources that they are offering in science, mathematics, and other subjects. Most of these resources are in Grade 6-12, but recently, they have starting adding materials in lower grades (see Elementary School Mathematics). Included in the resources are videos that tackles mathematical concepts. 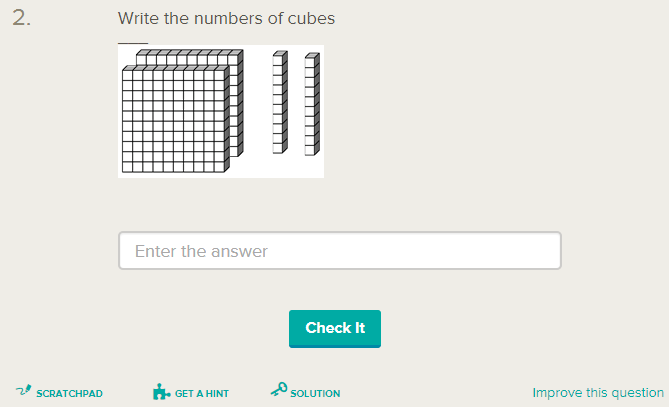 For example, the video on Using Cubes and Creating Place Value Diagrams introduces the concept of place value using cubes that are grouped into hundreds, tens, and ones. After the video, the students can answer questions in the assessment section. One sample question about the lesson above is shown below. CK-12 Foundation offers K-12 resources for FREE in Mathematics, Science, English, History, Astronomy, Engineering, and SAT Preparation. One of the great things about mathematics is that sometimes, you find mathematical concepts in places that you don’t expect them to be. There are also concepts or representations that seem not connected to mathematics, but you will realize that it is indeed mathematics. In the video below, observe how to multiply using lines and their intersections. Don’t just watch the video for the sake of entertainment. I encourage you to think about it. Can you think of other concepts that is similar to the intersection of lines? Is there a similar representation or idea that is also connected to this representation? In the next post, we will try to answer the questions above, so keep posted.